Support Chromebooks on a Windows Domain Like a BossDone with Your Mobile Phone Contract, Not Upgraded, and Still Paying? 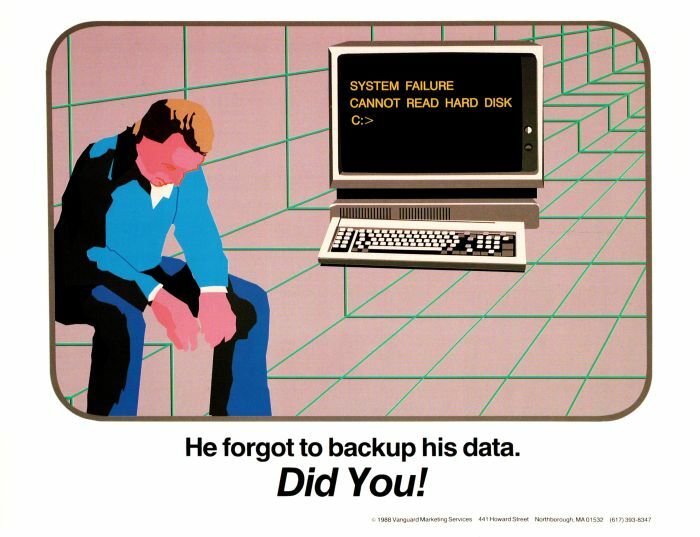 What a glorious find—a set of vintage posters from the late-80s, some kind of office tech PSA series. Where did they come from? I first saw them cruising around imgur last week. The time stamp says they were posted in 2014 by a user named ericv. Eric says he found them at work; OP lives in Madison, Wisconsin, but the copyright on the images lists Vangaurd Marketing in Northborogh, Massachusetts. A ten minute Google search turned up nothing about a company by that name and location that would tie it to this poster series in any logical convention. The grid design suggests work by Michel Tcherevkoff, a conceptual designer who did covers for Omni magazine in mid-’80s. Pretty sweet, right? I remember reading Omni back in my Oregon Trail playing days. Glowing grids portrayed anything “technological” in this era. The film Tron (1982) is probably the most prevalent use of the aesthetic. Another famous instance predates this. Who can place this screen shot? Now let’s check out these awesome office tech PSAs. There are some real gems in here. Open_Sesame is better than ‘password’ is. I hope MUM Isn’t the password, either. Private eyes. Are watching you. The real takeaway here is the office tech problems from the ’80s haven’t changed much since then. Asinine password behavior remains the ire of security professionals. Companies still struggle to adequately backup data, and fly without a disaster recovery plan. Egregious mishandling of sensitive data is a problem from the C-level on down. There are a slew of office tech problems on top of these today. Phishing attacks, ransomware, wasting time on imgur at work, the list goes on. It’s a grid-like jungle out there. You have to be careful. It is a shame that these images are probably too small to print and hang at your office. They are relevant and beautiful reminders to avoid being a jerk with your office tech. What a glorious find—a set of vintage posters from the late-80s, some kind of office tech PSA series. As to the “what is this screenshot,” I saw Star Wars when it was first released. I think that that’s from a targeting computer in the raid on the Death Star. Bingo! Indeed, that is the targeting display for the X-Wing starfighter. Makes me think of the old console video game Battlezone. Which is reminiscent of the ’80s arcade classic Battle Tank.